The Nature does not demand much from us. In fact, it demands almost nothing. 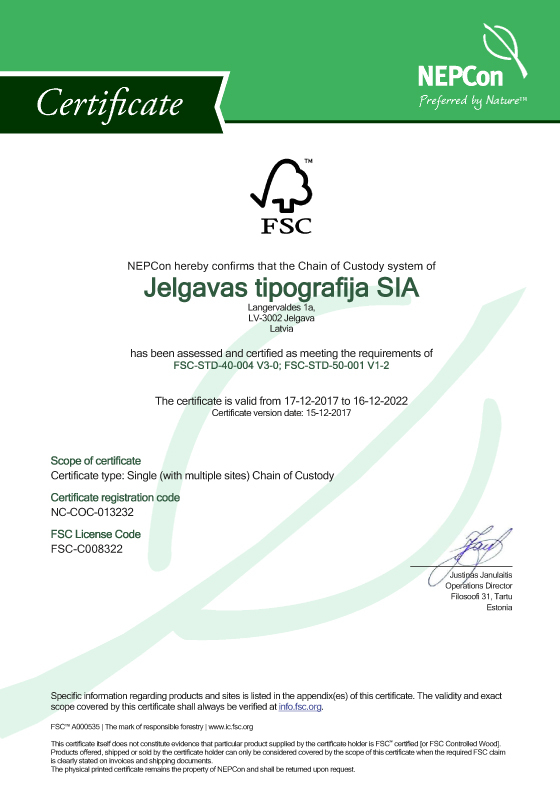 Just next time when you will lay flooring, buy furniture or print a booklet or a book, choose materials bearing the FSC® label. It will not make it more expensive. And the Nature will sure remunerate you. • We organize management of used packaging, disposable dishes and tableware, environmentally harmful products and electrical appliances thus providing an opportunity for our clients to obtain a 100% exemption from Natural Resources Tax as well as to ensure that waste generated by their economic activity is collected, recycled and goes into repeated circulation. • We organize environmentally educational activities. SIA "JELGAVAS TIPOGRĀFIJA" © 2017 -All rights reserved.